There’s been a lot of debate about how much the toxins that come from filament can potentially impact your health, so much so that we’ve seen a number of makers create their own air purifiers. But another maker-minded activity that has been proven to be especially unhealthy under improper conditions is soldering. Breathing in fumes during the soldering process can create serious health issues, which is why a fume extractor is oftentimes a necessity for most workshops. 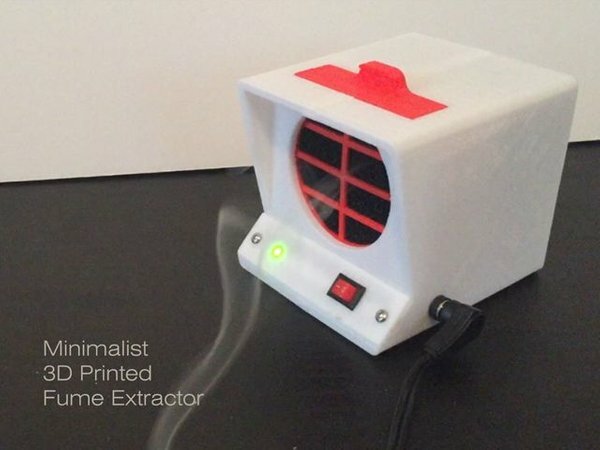 That’s why one designer and maker, who goes by rdmmkr on Instructables, has recently garnered some attention for their minimalist 3D printed Fume Extractor. Recently shared on the Instructables website, this fume extractor was designed with functionality, cost, and simplicity in mind. It comes with a removable filter cartridge that makes swapping out activated carbon filters a sinch, and it also fits popular brands like the Hakko 491, 493, FA-400 fume extractors. Needless to say, a fume extractor should be a staple in every maker’s workshop, especially those who spend a fair amount of time soldering the day away. Want to keep the nasty soldering fumes away? 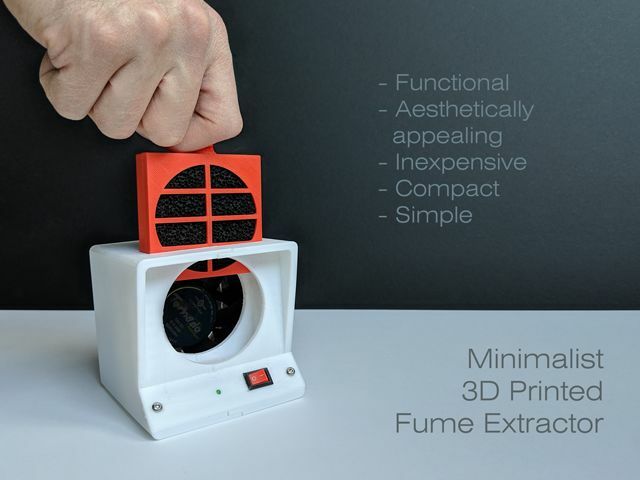 Let’s take a quick look at what you need and how to build this minimalistic 3D printed Fume Extractor on your own! 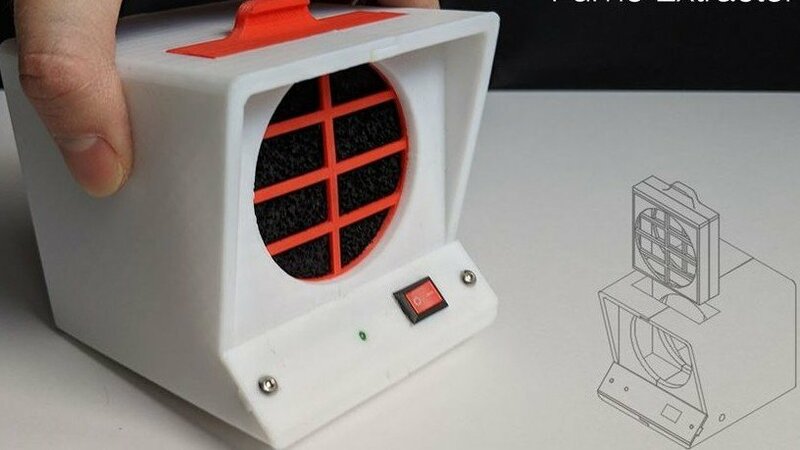 The STL files for the 3D printed Fume Extractor are available to download via Thingiverse. There are five different parts to 3D print, none of which should require any support structures thanks to the two-part design of the enclosure and cartridge. 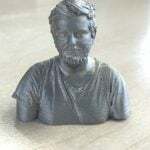 In their example, the creator of the project uses simple PLA filament, but feel free to try it out with the material type and color of your choice. Bare in mind that this project requires quite the list of non-3D printed components, all of which can be sourced from the likes of Amazon, Banggood, or even your local hardware store. You’ll also need a handful of tools, including a soldering iron, M3 hand drill, solder wire, and other things that are commonly found in the workshop. You can see the complete list on Instructables. Once you have all of your parts 3D printed or sourced, it’s time to move onto the assembly process, which is actually surprisingly easy. First, you’ll want to sand and file the rough edges of the 3D printed parts. Insert the fan into one half on the enclosure and attach the other side to ensure a snug fit. Next, cut a notch in the fan so that the wires can slide through easily, and also remove the yellow signal wire. Taking the carbon filter, divvy it up into 130 x 130 mm pieces, and insert two of them into the cartridge. By using multiple filters, the overall inhallation can be improved. Once the cartridge is snapped together, mount the fan grill to the back using M5 x 10mm PC case mount screws. After the basic assembly is complete, the next step is to start wiring and soldering. The shematic and information on this part can be found on Instructables, but all together seems pretty simple for anyone with basic soldering experience. And that’s all you really need to make your very own 3D printed fume extractor! Be sure to check out the Instructables for more information or to connect with rdmmkr. 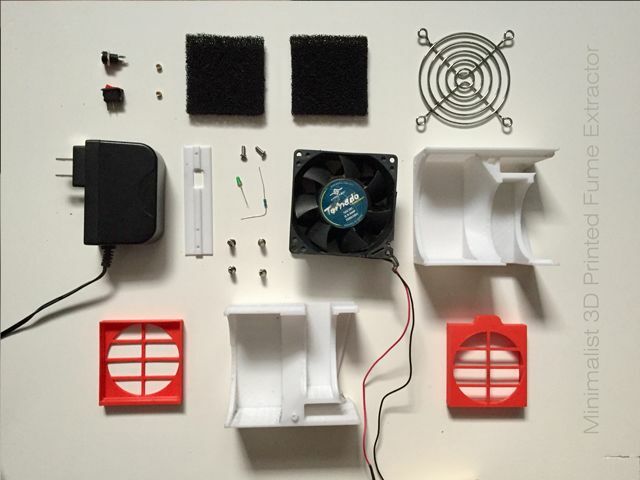 License: The text of "Weekend Project: Clear the Air with a Minimalist 3D Printed Fume Extractor" by All3DP is licensed under a Creative Commons Attribution 4.0 International License.